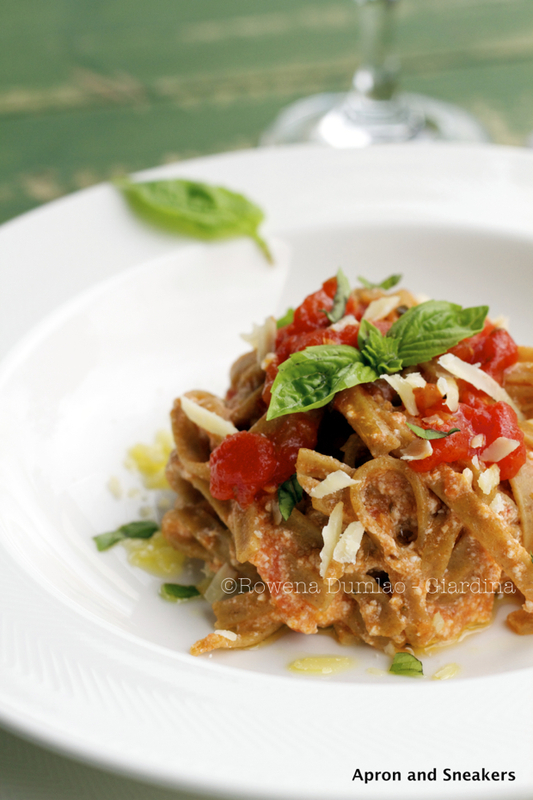 Now let me take my mind off the weather for the while and tell you about this pasta. The ingredients came from a farmer's market my husband and I discovered a few days ago. It was empty when we walked in because of the odd hour. Most of the farmers / vendors were all eating together as a big group and cooking their produce. It would have been nice to join them too if only we were not full and of course, if we were invited. After an employee of the Comune di Roma (Municipality of Rome) stopped us for a bit of survey, he explained to us that the vendors don't pay for the space. They are all given for free by the comune to the farmers for some reasons. It is to help give the smaller farmers a bit of space that the bigger producers are occupying and for the consumers to meet the producers. I totally applaud the whole concept of getting to know where your food comes from, who produces them and how they arrive to your table. Being an odd hour, we had the place all to ourselves and the vendors had more time to speak with us. The crops are all organic over everything. I've never seen so many imperfect crops before and I even saw a strolling caterpillar too. If that little guy is oblivious to his surrounds without any fear of danger, then rest assured, my family and I are away from any harmful effects of chemical pesticides too. We spent time at the signore who explained everything about producing mozzarella di bufala and everything we needed to know about the animals themselves. There was also the couple who produces meat products using black pork and some cheese where we bought the ricotta I used for this pasta. And the nice signora who was producing this fresh tagliatelle di farro and everything farro (emmer) in her stand. She was the one who suggested this recipe. 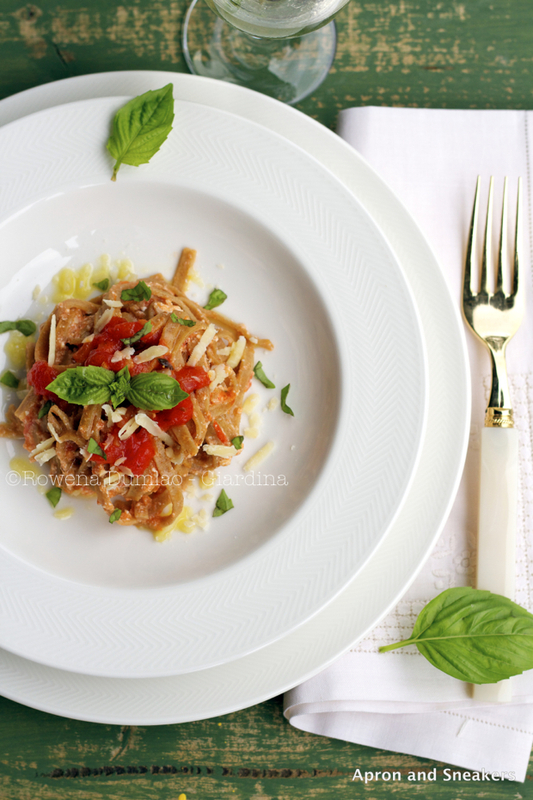 It's how she enjoys her tagliatelle di farro at home. She should know best. 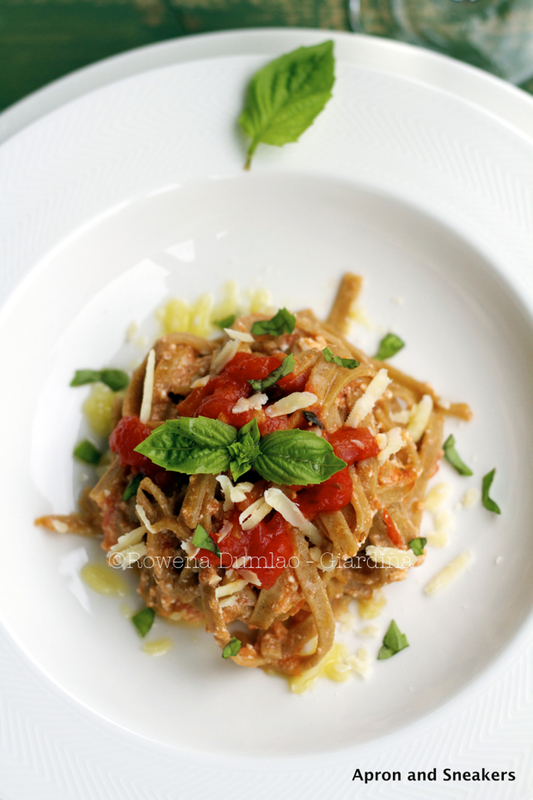 So from her table to our table to yours, here is a delicious way to enjoy tagliatelle di farro. If you don't have fresh tagliatelle di farro and are lazy making your own like me, just replace them with the regular pasta. Buon appetito! Boil water for pasta. When it boils, add salt then put the pasta. Cook according to the number of minutes indicated in the package or until al dente. Meantime, while waiting for the water to boil, warm up a large saucepan with extra virgin olive oil. When oil is hot, sautè the onion. After about a couple of minutes, pour the tomato puree. Boil and simmer on low fire for at least half an hour. Season with salt & pepper at the end. Mix in the ricotta with the tomato sauce. Mix in the cooked pasta and coat with the sauce well. Drizzle with extra virgin olive oil and sprinkle the chopped basil.